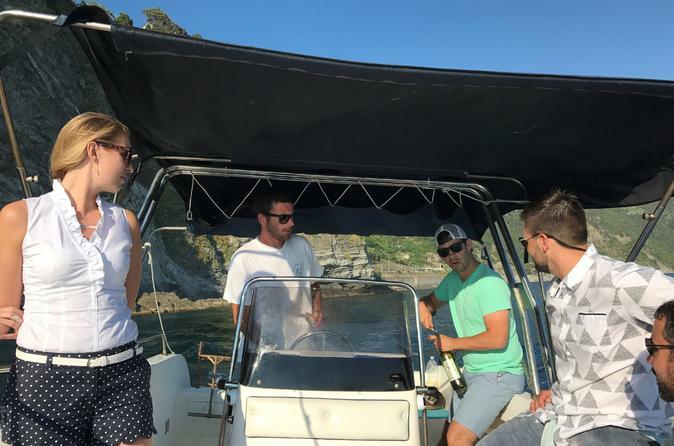 Book a private Cinque Terre boat cruise, and see the region’s coastline in the soft, early evening light. As a skipper navigates the boat, you’ll sit back and admire sights of the Cinque Terre’s fishing villages on a 2-hour route from Riomaggiore. Sip on wine, enjoy olives and focaccia, and watch the sun slip into the sea. Food and drinks are at your own expense. Head to Riomaggiore’s marina and board your private boat for an evening cruise. The route takes you into a marine protected area, alongside the shores of the UNESCO World Heritage–listed Cinque Terre. The region is famous for its rugged coastal landscape and its five fishing villages that are stacked into the hillside above the sea. As day turns to dusk, gaze out at the winding trails that connect the villages, and glimpse stretches of a 19th-century railway line that tunnels through the cliffs. Through your 2-hour cruise, snacks and wine are available at your own expense. Nibble on olives and flavorsome focaccia, and sip on a glass of wine as the sun sets. Your cruise ends back at the marina. We had an amazing time, but the tour was not exactly as advertised. The boat was tiny, literally a small motorboat, and messy as boats are - I was under the impression this was more of a proper tour with cocktails, and what really happens is you make your way to the dock rock outcropping and the manager will hand you a grocery bag of a bottle of wine, plastic cups and a wrapped up package of focaccia bread. We were dressed for dinner afterwards and so it was a bit ridiculous but we did have a fantastic time. Drank the wine straight from the bottle because otherwise there would have been wine spilled all over the boat! Focaccia was nice to have, but for 15 euro pp 1 bottle of wine and the bread was funny. Our captain was amazing though, and took us all around the coast, we got some amazing pics and the sunset out there was just perfection. So, if you aren't expecting anything fancy this will be perfect for you. Wear boat or swim shoes, a bathing suit w a cover up, towels, and girls w long hair bring something to pull it up, windy! You can swim off the boat in a few places. It was a fantastic tour, but just not described clearly on the site. Enjoy the Cinque Terre, we did! This is the best way to see all five towns! We were staying in Riomaggiore and it was easy and convenient. They picked us right up from the marina and then on to a private sunset cruise for our group. Our captain took us around the towns and stopped at a couple places for the guys to jump in and go swimming in the clear blue waters. They had two bottles of wine and a ton of focaccia for the group- so much that we took leftovers. No regrets from the group and a trip highlight for everyone. Thanks John and team for making our trip so memorable! very nice tour with beautifull views and settings! However, the food and drinks tasting were disappointing for the price: 30euros to get a focaccia and both 2 drinks was to little for the price.